Elliott Murphy will be Tom Needham’s special guest this Thursday at 6 P.M. on WUSB’s The Sounds of Film. Also on the program, is Long Island Music Hall of Fame inductee, Garland Jeffreys. Stony Brook, NY – July 5, 2017 – Long Island music legends, Elliott Murphy and Garland Jeffreys, will be Tom Needham's guests this Thursday on WUSB's the Sounds of Film. Elliott Murphy is well-known for his critically-acclaimed 1973 debut Aquashow. Since then, he has released over 30 impressive albums, including his latest, the Prodigal Son. The record contains his longest song to date, “Absalon, Davy & Jackie O.” Elliott is featured in the new documentary The Second Act of Elliott Murphy, which will be featured at the Stony Brook Film Festival on July 26th. The film features extensive interviews with Billy Joel and Bruce Springsteen. 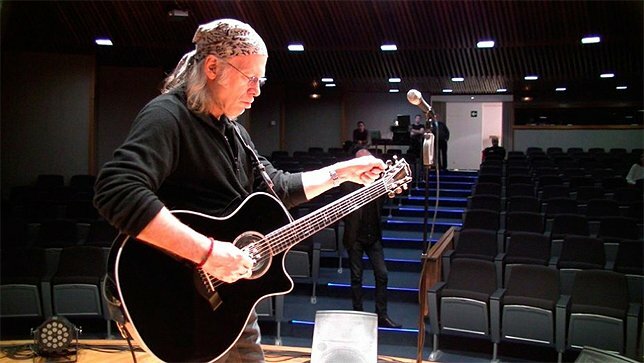 Elliott Murphy plans to be in attendance at the Stony Brook Film Festival screening. Garland Jeffreys is an American singer and songwriter. He is a recent Long Island Music Hall of Fame inductee. Garland is known for his songs “Wild in the Streets,” “Matador,” and “Hail Hail Rock ‘N’ Roll.” His music has been featured in The Get Down, Beverly Hills 90210, and Life on Mars. Garland Jeffreys will be performing at the Stephen Talkhouse on Friday at 8 PM. The Sounds of Film is the nation’s longest-running film and music themed radio show. For the past 30 years, the program has delivered a popular mix of interviews and music to listeners all over Long Island, parts of Connecticut and streaming live on the Internet. Previous guests include Mike Leigh, D A Pennebaker, Josh Fox, Wallace Shawn, Donny Most, Ralph Macchio, Carter Burwel, Billy Joel and Big Daddy Kane. Subject: LongIsland.com - Your Name sent you Article details of "Long Island Music Legends, Elliott Murphy and Garland Jeffreys, on Tom Needham’s The Sounds of Film"